When I was a child, I gained a lot of my sewing skills by sewing for my Sasha doll and my sister's and cousins' Sasha dolls. So a pattern set that teaches girls to sew sized for a Sasha doll is long overdue. Although new Sasha dolls have not been made for nearly two decades, I know there are still a lot of Sasha doll owners out there. Some may want to expand their sewing skills, others may want to teach a child or grandchild. So for all of you Sasha doll owners, this one's for you. The Sasha Gets Dressed learning to sew dress pattern set is now available in my shop. The tutorials that accompany the patterns can all be found here, and more are coming. After designing Phoebe, the big sister doll, it was not long before she felt lonely without a baby sister. I set out to design a baby doll. I thought we'd have a baby in no time. Babies are smaller, simpler and the 1950s produced many baby doll patterns with a three dimensional head. Two months and many iterations later, I had learned that capturing the essence of a baby in a hand made jointed baby doll was more difficult than designing an upright post-toddler girl. I used the Sasha baby dolls as a model. Their arms and legs have a curve to them that beams baby. The baby's face and hair were the next challenge. I've noticed that the best baby faces are simple and understated. My first baby had large eyes. Babies' eyes are relatively large, but on a doll that looks martian like. My latest crop of babies have small eyes. Egg's hair is a bit amplified. 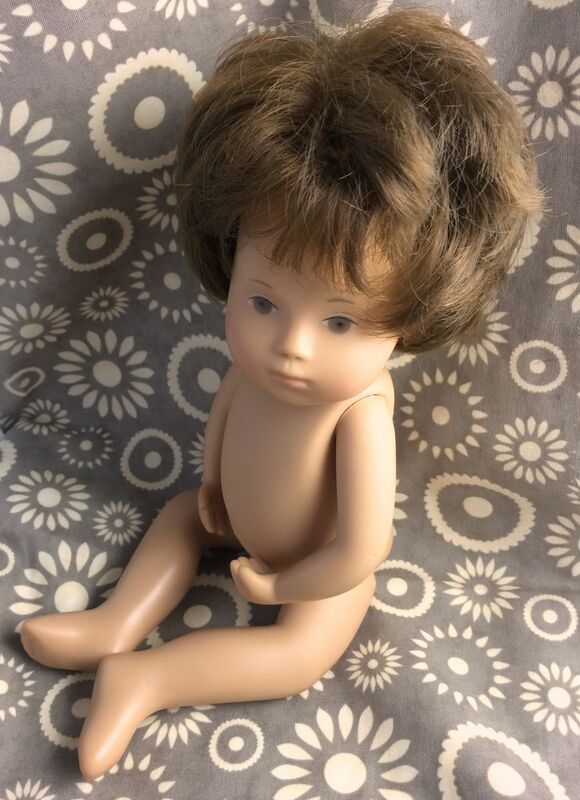 Babies don't have a lot of hair, but most girls like their dolls to have hair.